The more money we raise, the more vulnerable refugees we can help. I confirm that the donation was not in return for tickets (raffles, actions, events) or for goods or services. I am neither donating on behalf of someone else. Read more about Gift Aid. A Direct Debit has been setup for your donation of £XXXX YYYY. You will receive emails from our Payment Provider, GoCardless, with more details. A Direct Debit mandate is pending approval for your donation of £XXXX YYYY. You will receive an email from our Payment Provider, GoCardless, with instructions to complete your mandate. For security reasons the session is now closed. You&apos;ll receive emails from our Payment Provider, GoCardless, with details of your Direct Debit. If you haven&apos;t submitted your details to GoCardless, please start again. An unexpected error has caused the payment process to fail. Please try again or, if you&apos;ve already tried again, contact us to report the problem. 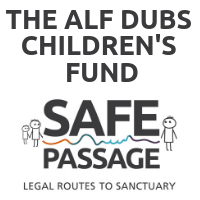 Will you support our work giving child refugees a legal route safety?